When I finished upgrading my Procab to wireless, I had put 4 new AAA batteries in and tested the unit OK. I turned the unit off and did not use it for a month, while I replaced some code 80 with code 55 track. When I was ready to test the track, I had discovered that $4.25 worth of batteries were dead. After searching the web I found that other users had had the same experience, and some were installing small switches. Well, since I'm on a budget (unemployed at this time) I decided to see what solution I could pull out of my junk box. A PCB Jumper was the solution! (See #1 in the photo below) It is a yellow bi-pin jumper with a handle-tab. 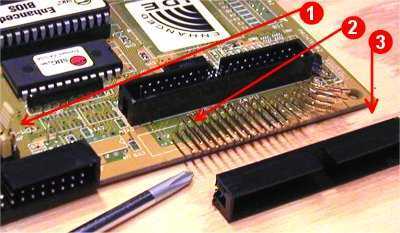 I got the jumper and pins from an old ISA computer board in my junk box, after determining that I did not want to use a dipswitch which were available on another board in my box. In the photo below, #1 shows the yellow jumper with the handle-tab. #2 shows the angle pins that I used after pulling #3 the black plastic IDE Key off the pins. This next photo shows inside the Procab, where the wireless upgrade board is mounted. 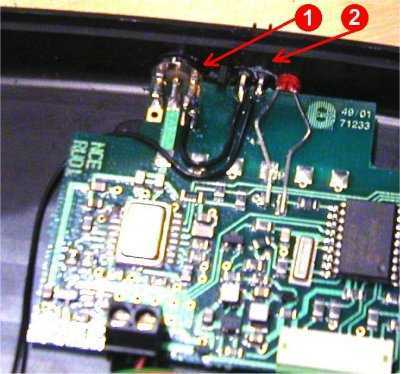 #1 is the terminal block where the battery wires normally mount. #2 is where the angle pins come through the Procab case. I drilled 2 very small holes through the wireless upgrade PCB (after measuring the spacing to match the jumper spacing of 0.1") and pushed the angle pins in. Then I held my soldering iron against the pins while pushing the wireless board in place. The heated pins melted through the Procab case nicely. 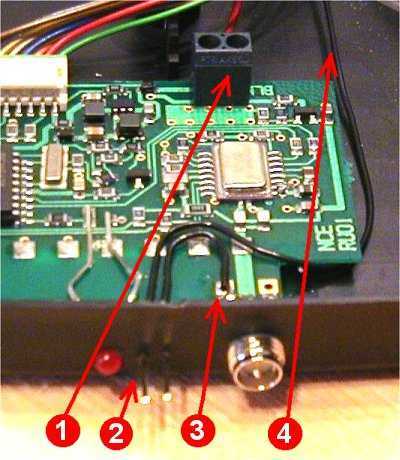 This last photo shows the antenna ground solder point #1 and the angle pins #2. In effect I am just using the yellow jumper as a battery switch now, and I just have to move it from both pins jumped for on, to any 1 pin for off.